CIS is delighted to share that MA student Huzaifa Shahbaz has been a lead researcher on the project, The Global Rise of Ethno-Nationalism and Demagoguery, at the Haas Institute, UC Berkeley. The research findings are intended to be released in a publication this semester. Congratulations Huzaifa! 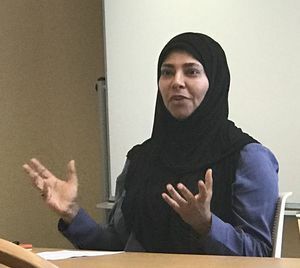 Congratulations to PhD student and Presidential Scholar Mahjabeen Dhala (right), who has been invited to India to present public lectures on Women in the Quran, Feb 5-9. Congratulations to CIS Research Scholar Carol Bier for her book review of Dr. Gulru Necipoglu's The Arts of Ornamental Geometry in the Journal of Mathematics and the Arts. CIS will be partnering on several events and classes during Black History Month and beyond. Please see the CIS webpage for details.